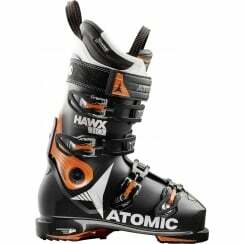 The latest addition to the Hawx Boot Series is Atomic's lightest alpine boot ever created. The Hawx Ultra is a whole new breed of ski boot. 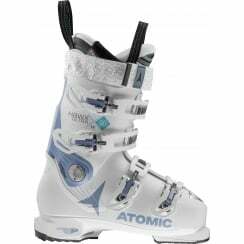 It marks a new chapter in Alpine boot design, drawing on Atomic's racing and touring expertise to create a boot that combines the best of both – lightweight design and full-on power. And it's about to change everything. 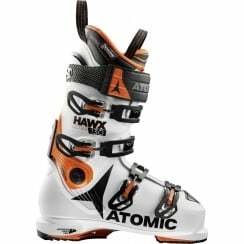 The Hawx Ultra is Atomic's lightest alpine ski boot ever – and by a long way. In fact, it's 25% lighter than any other! The designers achieved this thanks to a radical new progressive shell that cuts material and thickness around the boot where it's not needed. Then an asymmetric Energy Backbone provides reinforcement in key zones. The result is the best combination of agility, snow-feel and power ever felt in an all-mountain boot. Like all Hawx boots, the Hawx Ultra features Memory Fit, so you can customise all three parts of the boot – the shell, cuff and liner – and get a perfect personal fit in minutes. However, the boots also boasts a new Memory Fit 3D Liner. This has a pre-shaped thermo-formable heel and ankle areas, so there are no pressure points and you get an unparalleled foothold. It adds a whole new level to the comfort of the legendary Hawx first fit. Elsewhere, Atomic have also added new Cantable Grip Pads. Plus Power Shift and Cuff Alignment. All in all, an exciting new era for the Hawx family. A lighter, faster, more exciting one.